illustration | Adventures In Styleland! 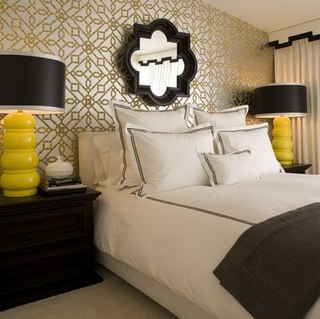 Quatrefoil in design is basically a four-lobed shape and is usually a symmetrical pattern that repeats itself. It is classic with religious and architectural history. My wonderful daughter Rosaria is just smitten with this design, our next project for her room will have to start shortly (she is still dealing with Aqua and Brown Damask, soooo done with that!!) so we are looking for a design we like. 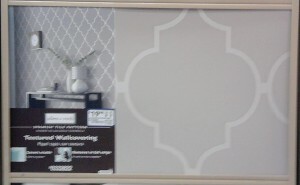 I thought I would do the quatrefoil on her ceiling in metallic silver over a pale gray?? That’s were we are starting, she also would like to incorporate some purple in to this design. So starting with inspiration… This great wall covering I found at our local Lowes I am so excited!!!! I would like to do the larger damask on her ceiling and maybe the back of her book shelf in the smaller pattern!!! Of course I love this ceiling!!! 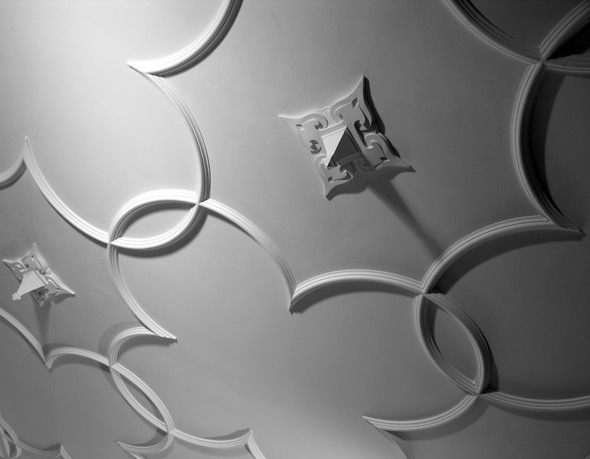 this architectural product is purchased in tiles and installed as ceiling tiles. 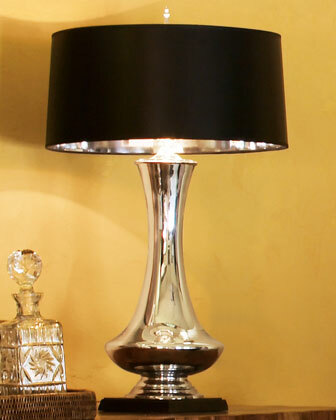 This product is on Jay Haon Art and Design website. This master sweet uses a strong yellow to balance out the grey. 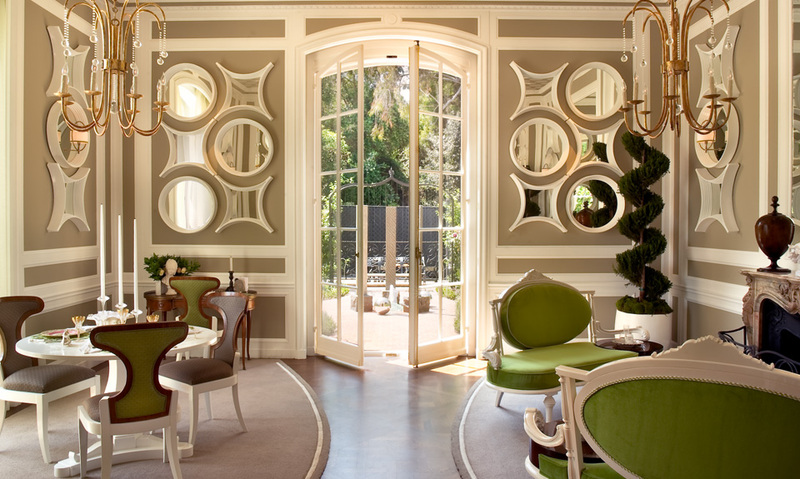 The quatrefoil mirror is one of my favorites, used with this wall paper and layering the quatrefoil design in this space, creates a great mix of patterns. 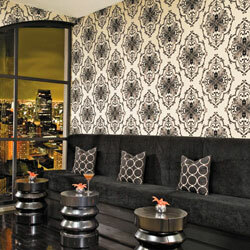 This Seabrook Wallcovering used here gives depth and color to this wall. Grey is one of the colors that we have worked with recently, in feng shui this color represents the metal element which brings sharpness, precision, clarity and efficiency! 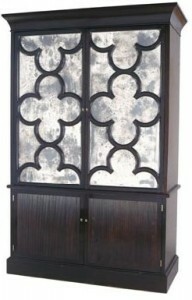 This armoire is so pretty, and with the mercury glass doors it adds that touch of WOW to any space! 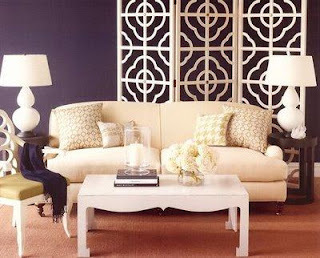 Quatrefoil is so prevalent in furniture design, from wood to fabric this timeless design is sure to stay! Hey friends, just a quick post to tell you how impressed I am with the talented people who share their passion for Lighting design with the world around them. 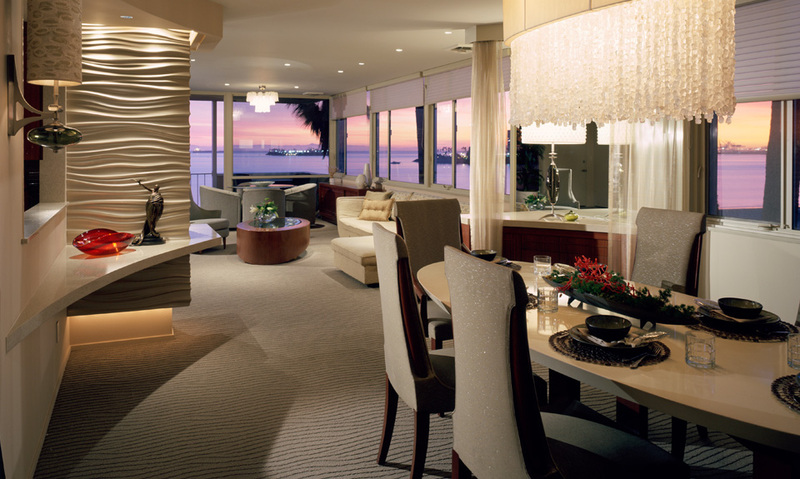 I have always loved the way it creates our surroundings, lighting is an intricate part of design. Illumination is the ephemeral partner of architecture. Light is invisible until it strikes an object or surface. And it is controlling this difficult, transitory medium that gives the lighting “artist” the ability to create hierarchies, dynamics and mood. Lighting design has become a creative extension of architectural design, improving visibility and complementing form, program and color. Niskayuna New York, which is where I live has GE Research and Development and RPI (Rensselaer Polytechnic Institute) close by, they are two of the leading Lighting research and development centers in the World! 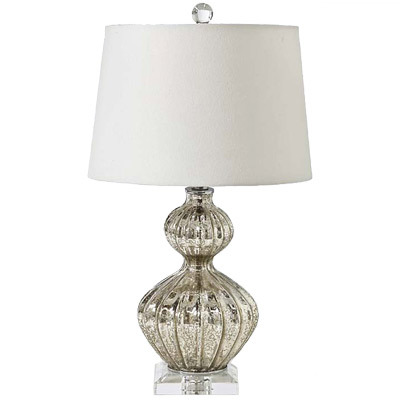 Cylinder shades are still the rage this year and metallic finishes, mercury glass, brushed nickel, acrylic and glass are so prevalent, here are some of my favorites. Linda Allen sees an electric future for wireless lighting. A future where stylish, battery-powered lamps can be moved wherever they’re needed, whether from room to room or out of doors. A future where practical, solar-powered lamps bring artificial light to parts of the globe where it’s never been available before. 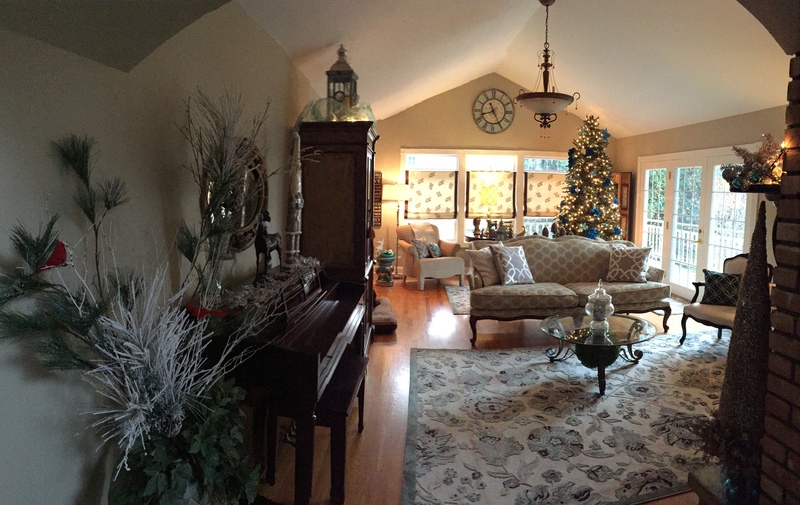 Here is another design from Linda, this room not only had great lighting but superb design, the use of color and pattern in this room shows how talented this designer is. 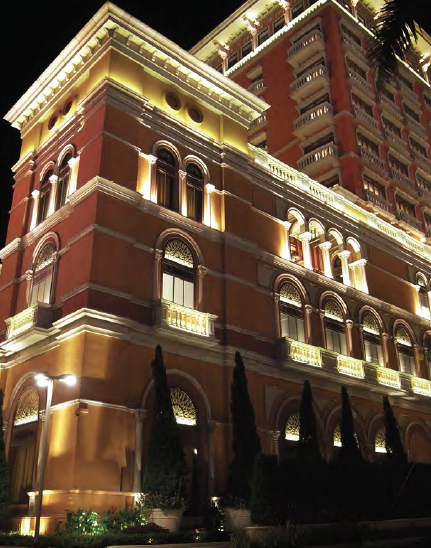 One last lovely lighting design that I wanted to share with you, the exterior of this building is so beautiful, I know that this will enlighten you as to the importance of lighting in your design.